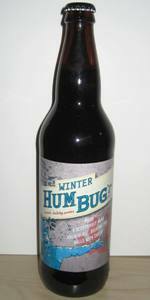 MacTarnahan's Brewing Company Winter HumBug'r Ale--a rich, holiday porter--Enjoy A Deceptively Dark Holiday Ale, Decking The Halls With Cheer--2009 Release--22 oz. Bottle. 5.30% ABV--27 IBU's. (3.9 / 5.0) Porter. Thin fizzy tan espresso thin lace head. Clear dark black red color. Roasted mild espresso hop front. Thin dry sweet burnt biscuit mild bitter cocoa zesty CO2 minimal fruit body. Clean dry bitter sweet mild hop refreshing Porter end. Well made but a hint bland. Sampled 11/6/2009. 2 --$2.17 Each. 2009 Release--12 oz. Bottle. 5.30% ABV--27 IBu's. (4.25 / 5.0) Porter--Thick pour. Dense mild lace half finger espresso head. Clear dark black red edge color. Rich roasted mild hop front. Mild creamy cloying malty rich roasted burnt black bread dry espresso cocoa Porter body. Lingering roast clean mild hop tangy crisp end. Nice! Sampled 10/9/2009. 6-Pack--$6.49. MacTarnahan's Brewing Company Winter HumBug'r Ale--a rich, holiday porter--Enjoy A Deceptively Dark Holiday Ale, Decking The Halls With Cheer--2010 12 oz. Bottle. 5.30% ABV. 27 IBU's. (4.0 / 5.0) Big foamy lacy espresso head thins quickly. Sediment hint. Opaque dark black color. Rich roasted mild chocolate spice hop front. Creamy mellow sweet roasted doughy malty smooth Porter chocolate body. Clean mild hop spice lingering malt end. Rich textured. Well Made. Sampled 11/1/2010 from 6-Pack purchased for $6.99 at Seattle Fred Meyer--Ballard on 8/24/2010. MacTarnahan's Brewing Company Winter HumBug'r Ale--a rich, holiday porter--Enjoy A Deceptively Dark Holiday Ale, Decking The Halls With Cheer--2010 22 oz. Bottle. 5.30% ABV. 27 IBU's. (3.75 / 5.0) Porter? Big dense lacy coffee head. Opaque dark black bronze edge color. Toasted sweet chocolate hint mild hop front. Mild sweet soft black malt light Porter body with light biscuit coffee cocoa hints. Mild hop spice clean smooth end. Tasty odd UnPorter. Black Pale Ale. Sampled 8/28/2010. 2 @ $2.38 Each. six pack from Roths Vista Market,Salem. Lovelly looking ale darkest,mahogany brown with a gorgeous thick half inch light tan head. Typical roasty,toasty,burnt porter aroma. I had susupected that this might just be a re-label of the Regular McTs porter but the first sip tell me this is different, much more toasted, burnt oat kinda feel to it, more dark fruitiness. Bitter dark chocolate dominates some spiciness towards the end also . Palte is weird..its very well carbonated for a porter but really doesnt distract. Overall a nice simple winter ale. MacTarnahans aka Portland Brewing seems to be re-awakening after a long sleep since its take over by Pyramid. Lets hope Pyramid continues to give them more independence. Other comments: "A rich, holiday porter." Not quite an accurate description. Porter, sure. But it's not particularly rich. This is a great winter porter. Pours a nice black oil color with a gorgeous chocolate froth foamy head. The smell is of dark roasted malts. The taste is smooth and hints of roasted cocoa. Goes great with smores and or cheesecake. A great beer at a great price 2.17 for a 20oz. Pours a nice black color, nice carbonation, nice little creamy/fizzy light tan head, with some sticky lacing left behind. The nose is malty, with some nice chocolate/toffee notes. The taste is malty, chocolately, slightly sweet. Medium body. Drinkable, a tasty brew, surprised me. No real head.. no lace... the brew is perfectly black.. Ink. Nose immediately reminds me of the Blackwatch without as much licorice.. smells black. Flavor is more stout than porter.. dry roasty malts.. with warmth some malty sweetness helps pull the brew together.. chocolate with a weird tart essence.. odd. Fresh and more interesting than inviting.. seems pretty limp... too burnt as I finish the bottle... Not sure what to make of this one. A dark dark porter. Pours a nice foamy head that slowly dies into a thin lace. Not much aroma but this is a porter. The taste is very roasty, chocolatety, smokey - typical porter really - nothing very special. Mouthfeel is a little thin, but this not a stout right? The price is right though, not a bad choice is the Anchor or Butte is not stocked. I bought a bottle of Humbug'r in a grocery store. $3.99. Poured in to a pint glass. Pours an opaque black color with a bubbly beige head that reduces to a thin froth. Smell is a sweet chocolate milk aroma. Taste is a roasted grain and coffee flavor, but with a bit of an acerbic vinegar like flavor on the finish. Mouthfeel is a bit watery, with a dry bitter aftertaste. In terms of drink-ability it's not the best porter around, and is really nothing special in terms of the holiday season either. I'm probably not having this again. DO NOT buy if you are expecting an ALE!!! Not one of my favorite Winter Ales this season. It's sold and self advertised as a Winter Ale. It says it's a "deceptively dark holiday ale" however it is in-fact a winter porter. If you read the neck label on the bottle it reads "The limited edition Porter with a deep, dark character and rich malt flavor that will unravel your ribbons. As far as porters go, yum! It's reminiscent of Bare Knuckle Stout and Boddington's. Not very hoppy, more barley flavored. I picked this up for a great price considering the price of a bomber these days. I think it was on sale for $2.19. It was well worth the price. It poured a dark black with a creamy foam head which was 1-2 fingers. The smell was normal for a porter and had a nice coffee aroma to it. The taste was good and tasted like a porter should. Mouthfeel was pretty light with normal carbonation. Overall not a bad effort. We are talking about a porter here. Author of Beervana hammered it because it was a season winter brew? Obviously too smart for his own good. A- Dark with a nice frothy tan head. S- The smell was very to the style of a porter, roasty with a good hit of coffee. T- This was a very standard porter type beer. I would have loved a bit of spice or something to feel a bit more winter like. But good coffee notes and a slight vanilla hit. Very roasty. M- Thin, thinner then I would have thought, but still good with the style. D- Not too bad, easy to drink for sure. 12oz. bottle from a six pack my wonderful girlfriend brought home. A- Not much head to speak of, even with an aggressive pour,it only foams up to a finger thick than fades to a skim on top of the liquid. medium tan/beige in color. the body is an extremely dark root beer brown, and lets very little light through, almost black with no lamp, but there is something about it where you know it's brown. N- toasted berad noted and some roasted malts and slight toffee or caramel scent. tiny bit of a coffee and sourdough kind of a smell. faint floral hop smell if that is what I pick up on, not at all strong though. T- a bit sour and bitter. roasted malt in the background and some fruity esters. much more herbsl hop taste than nose would lead you to believe, comes out in the taste early on too. not more than style calls for, or even on the heavy side for yankee porter, but more than the nose would have you think. has the tiniest bit of smoke on the finish along with the toffee taste. M- a bit on the thin side for it's style. good if you live in the tropics, or desert, but I just like my porters with a bit more viscosity. still had a nice carbonation level and a lovely bitter/sour twang to it. again however; too thin. D- For starters i like when a brewery makes dark styles for winter beer. rather than just another hop bomb IPA. also this one ssessions well, and I love the sour twang. over all geed brew. pours a clear dark brown with a red tint with held to the light, a large khaki head, and some lacing. smell is faint, sour malt, caramel, and some spice. taste is watery, spice, some metallic, caramel, and a little sour malt, end is a little on the tart side. Snagged a bottle of this... heard it was really good from a brewing buddy of mine. - Dark solid brown and black... mild off-white head.... little see-through around the edges.... looks like its supposed to! - The smell is fantastic... grains, slightly sweet oats... roasted nuttiness.... light spice and bittering hop. Quite nice. - Very light and tasty porter.. clear waters... light grain and sweet nuttiness... nice bitterness... overall a fantastic porter, and fits the style very well. Because many beers are overdone anymore, I am sure this porter wont get the credit because it fits the style so well. - Light bodied... slightly watery.... not robust and chewy like the smell might lead one to believe. - Overall a very nice session porter... tastes great, easy to drink, and is a nice regular go-to seasonal. This was a great beer. I really get into the winter beers and somehow this beer sat in fridge until since Christmas. Appearance: black with a little ruby when held up to the light. Nice two-finger tan head when poured, but it dissipated relatively quickly; still pretty nice, though. Smell: lots of roasted malts with a little chocolate and a little twang. Not bad; quite standard American porter aroma. Taste: chocolate right up front with some tartness; the tartness fades away leaving some chocolate in the middle which subsequently fades to some subtle coffee notes among other roasty flavors. It's actually quite a solid porter, and I appreciate this dynamic flavor profile. Mouthfeel: on the lighter side of medium; could be a little better in my book but not bad. Carbonation is minimal, even for the style. Drinkability: this is a solid porter. It could make a good session beer. This is billed as a "rich, holiday porter" and a "deceptively dark holiday ale". I don't get much holiday out of this; it has none of the qualifications for a traditional Northwest winter warmer. It is, however, a quite decent porter, which I would probably buy again if it were available around here in six packs. Poured into a Black Raven imperial pint glass. Pours a dark, nearly opaque red brown with cola tint at the edges. Two finger fine light brown head with good retention and lacing. Looks nice. Aroma of roasted malt, slight chocolate and a hint of earthiness. Flavor follows with roasted malt, a hint of chocolate. Finishes rather abruptly and somewhat dry, with the hops and spices leaving a somewhat mineral taste. Fairly light flavored, starts off pleasantly, but the thin taste does not hold up. Light to medium bodied. A satisfactory dark ale, but somewhat thin and lightly flavored for a porter. Happy to finish this one, but will probably not look for this again.